1Department of Accounting, Faculty of Management Sciences, University of Benin, P. M. B. 1154, Benin City, Nigeria. 2Department of Accounting, Ambrose Alli University, Ekpoma, Edo State, Nigeria. *To whom correspondence should be addressed. E-mail: dominic.erah@uniben.edu, dominic_erah@yahoo.com. Received 22 January, 2017; Received in revised form 28 February, 2017; Accepted 03 March, 2017. Corporate attributes, Earnings response coefficient, Earnings informativeness. Earnings informativeness continues to be a challenging issue for investors, financial analyst, management, regulators and academic researchers. The need to be able to ascertain how and why accounting numbers especially earnings are impounded into indices of a firm’s market or economic value drives the enquiry into earnings informativeness. Earnings informativeness refers to the extent of reaction of economic or market value to accounting disclosures. It is also an indication of the quality of earnings. 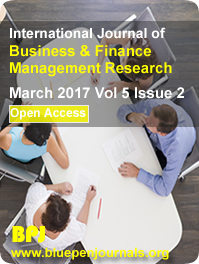 The study theoretically examines the role of corporate attributes in earnings informativeness by adopting earnings response coefficient (ERC) approach. This theoretical discourse is based on the noise-in-signal model which predicts that firms’ corporate attributes and practices can either heighten or lessen the noise connected to their earnings. The study adopted the library research methodology review of prior literature. The study observed that the various conclusions from prior studies on value relevance though relevant appear to be deficient in terms of valuation procedures compared to that which the ERC provides. The ERC gives a good understanding of why market value reacts strongly to disclosed information for some firms and weakly for others irrespective of the nature of news disclosed.